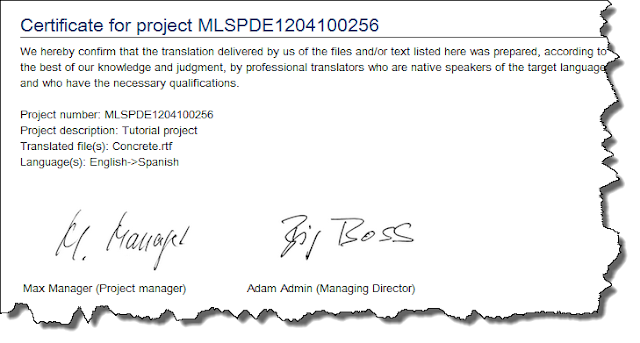 The project manager or administrator can generate a certificate in OTM to attest to the quality and correctness of a translation. The issuer of the certificate is the respective agency. The recipient of the certificate is the particular end customer. The certificate text can be edited and can be changed under >Administration >Standard texts >Documents (PDF) below the invoices section. Generating the certificate is optional and only possible if the relevant project has at least one line item with a translation service. Only one certificate can be issued per project. In case of an error, a certificate can be re-issued. The certificate for translations in a project is generated as a separate PDF document and saved in the project’s document repository. A certificate can be previewed before it is generated. 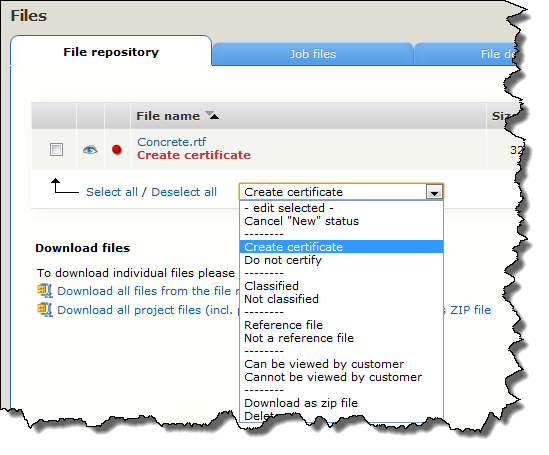 The certificate is produced at the same time as the final invoice if the option to create the certificate is checked. The certificate and invoice are generated as two separate documents and sent as two different e-mail attachments as required. A standard e-mail text from >Administration >Standard texts >E-mails is used automatically if a certificate is created together with the invoice and the option to send by e-mail is marked. The certificate will be printed on the agency’s letterhead. a) both custom tags [% SIGNATURE_PM %] and [% SIGNATURE_SECOND %] together or individually or b) the combined tag [% BOTH_SIGNATURES_SIDEBYSIDE %]. 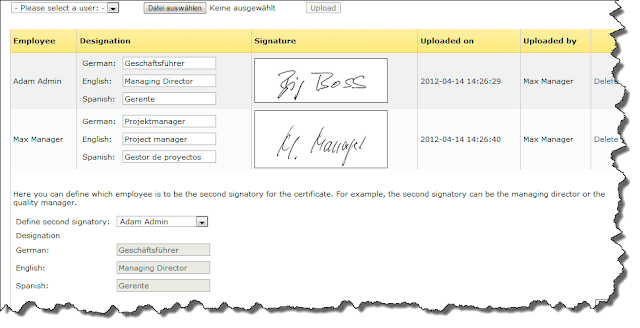 The signature files (file format: PNG or JPG) can be uploaded to OTM at >Administration >Corporate Identity >Signature files. The image is scaled automatically to a standard size and can be used at the desired position by setting a placeholder in the document. You can define whether the certificate should always bear the signature of a particular person (such as the managing director) or the signature of the respective project manager, or both. The certificate is associated unambiguously with the project via the file name and can be downloaded from the project documents.